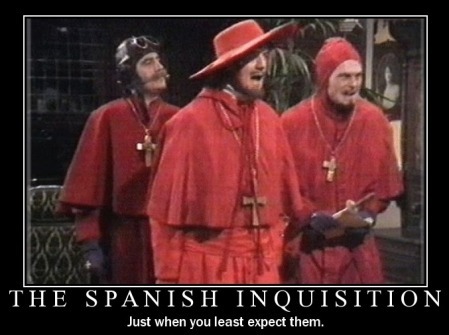 Nobody Expects The Mortgage Inquisition! It may seem like something out of a Monty Python sketch, but today’s headlines in one paper suggest that a “Mortgage Inquisition” is on it’s way. You can imagine the conversation, “Nobody expects the Mortgage Inquisition! Our chief weapon is surprise…surprise and fear…fear and surprise…. our two weapons are fear and surprise…and ruthless efficiency…. Our three weapons are fear, surprise, and ruthless efficiency…and an almost fanatical devotion to the FCA…. Our four…no… amongst our weapons…. amongst our weaponry…are such elements as fear, surprise…. I’ll come in again.” (With apologies to Monty Python). Of course there have already been whispers of “forensic” levels of questioning and analysis of budget planners and bank statements. Pet costs and regular donations could effect your ability to borrow as much as service charges, pension contributions and child care costs. Even budgeting for presents and washing were mooted in the past! Then we have some of the more “ridiculous” questions, as one commentator put it. Whilst it has always been a brokers job to make sure a client is aware of all the future costs and how they will impact on future plans, it is after all pretty hard to answer a yes/no question around spending plans for the future. This is in addition to the fact that waiting times for those getting a loan look set to increase, with some reports of, shock, horror, 3 hour meetings with your bank! Imagine that, a proper meeting to make sure that every borrower completely understands the costs and risks involved with taking out the biggest loan they are ever likely to have! About time, some would say! The problem of course is that with any new regulatory regime there are those who simply go over the top initially, before settling back down to a more sensible, workable approach. It was interesting to see that amongst the ramifications of the new regime, which finally comes into force at the end of this week, today’s article in The Daily Mail suggested low, short term fixed rates may disappear alongside interest only mortgages. I think it is an interesting point, but see no evidence to suggest this will be the case and have not heard anything similar from lenders. The point is that lenders are now stress testing against rates of around 7%, so for those borrowers who do take lower fixes initially they are already being underwritten as being able to afford a higher rate when that expires in 2 years’ time. Having 2 year products is an important part of a lenders armoury as for some, who may for example obtain a big bonus, increase in salary or even planning to move in two years’ time a 2 year product may be suitable. Why should everyone have to pay a higher amount on a longer term deal even though they can afford to? Just because a lender offers a low shorter term deal, this no longer means that this is all a borrower can afford. I still think there will be a competitive 2 year fix, discount and tracker mortgage market for some time to come. It is the same with interest only. This will no doubt continue to be available but for the “right” customer, more likely to be the preserve of the High Net Worth who have other sources of wealth with which to repay the loan, or the equity in the property at say 50%, is more than enough to provide comfort above a certain level. The real issue is that whilst the MMR has been in the planning and preparation stages for a while, with many of us at pains to make as many people aware as possible, it still seems that this will come as a surprise to many. It is of course easy to say that things need to be tightened up in the face of the past crises, until of course one try’s to get their own mortgage through in time to obtain the home of your dreams! Then we hear the phrase “why do you need to know that?” re-appear with a vengeance. The message needs to get out to borrowers in a calm and sensible way; prepare early, get your documentation in place, budget sensibly and watch your spending habits in the months before you want to apply for a mortgage. Given our discussions with lenders to date we certainly hope the reality to be somewhat different to the portrayal in the media today and whilst the fear element will no doubt be turned to fever pitch in the coming few days, we are maintaining close contact with lenders to understand how best to navigate the rough waters for our clients. No-one expects it to be plain sailing and there will be tears, tantrums and heads bashed repeatedly against a brick wall until everyone, brokers, lenders, borrowers, regulators, become more comfortable. The by-product could well be a small slowdown, which may be welcomed by those nervously eyeing London property prices, but lending institutions are not saying that this will be the case publicly at least. They still need to lend, they still have tough targets and the last thing the Government wants is another issue for house builders who suddenly have no one to sell their stock to again because they cannot qualify for a mortgage. It is a fine line to tread, but the MMR could be well timed; a short, sharp shock to stop people and prices becoming carried away once more. As long as it does not go too far and cause lasting damage. As for the ruthless efficiency part? Well at least the FCA seem much more organised than the last regulators so we shall see. They have shown a welcome attitude and seem happy to listen to those in the industry so I remain positive. What we do know is that an independent mortgage broker’s roll is now more important than ever.